Democrats and Republicans are jockeying for the title of Gas Price Slasher, though neither party has a plan that has any potential to reduce prices. While Democrats propose cutting oil company subsidies, Rep. Doc Hastings (R-WA) has introduced three bills to expand oil drilling, saying that they’ll spur employment in the Gulf and reduce U.S. dependence on foreign oil. Congress hasn’t passed a single piece of legislation since the Deepwater Horizon disaster last April to make drilling safer. The House passed a safety bill (when it was still controlled by Democrats) but the Senate blocked it. If passed, these bills would be the first action Congress takes on drilling since the spill. H.R. 1230, the Restarting American Offshore Leasing Now Act, which would mandate that the government sell oil and gas drilling leases in the next year for the central and western Gulf of Mexico and off the coast of Virginia – areas the administration decided not to lease after the Gulf oil spill last year. 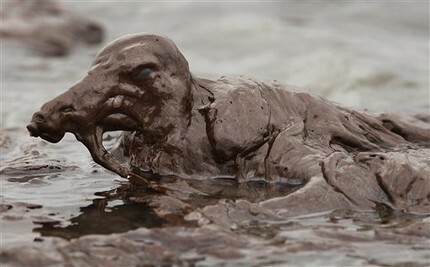 The bill also blocks court review of controversial environmental impact statements done before the spill. H.R. 1231, the Reversing President Obama’s Offshore Moratorium Act, is by far the most controversial (and has such a partisan name it virtually guarantees that no Democrats will vote for it). It would mandate that at least half the unleased area off the East Coast, the Southern California coast, the Arctic Ocean and Alaska’s Bristol Bay be put up for lease sales every five years until there’s nothing left to lease. Most troubling, future administrations could not reconsider or change this mandate, even in the event of a spill, or economic damage to tourism or another industry, or because there was no capacity to handle a potential emergency. In addition, an amendment slipped into one of the bills, according to Rep. Ed Markey, ranking Democrat on the Natural Resources Committee, provides for the extension of about 100 drilling leases, rather than putting them back on the open market for bids. He says that will cost taxpayers $10 billion and will require some fancy legislative footwork to resolve the hit to the budget. Democrat Tim Bishop (D-NY) filed a bill yesterday to repeal tax breaks for oil companies – something House Speaker John Boehner said last week that he supported, before backpedaling on those remarks. Bishop’s Big Oil Welfare Repeal Act (H.R. 1689) would repeal the domestic manufacturing tax credit for the big five U.S. oil companies, saving $1.5 billion a year. “This is a pure and simple tax subsidy that the American taxpayers are providing to five of the most profitable corporations in the world,” Bishop said, “even as they are paying now, in my home district, as much as $4.40 for a gallon of regular.” Meanwhile, the big five oil companies posted profits of $31.7 billion in the last quarter. Bishop’s bill attracted 59 co-sponsors its first day; not one was from the Republican party. But the Democrats did mention to reporters another initiative that could have a greater impact. Goldman Sachs recently rocked oil markets by announcing their conclusion that about a fifth of the barrel price of oil was based on pure speculation. Goldman called for a $20 drop in the price of a barrel of crude oil, now valued at $109.14. Speculation “has to be wrung out of the system,” said Rep. Markey. The GOP, always hostile to financial regulation, tried to cut the funding for the Commodity Futures Trading Commission in the last budget fight — the one entity that could rein in speculation. They didn’t succeed, but they’re likely to fight the budget increases the CFTC is asking for now. 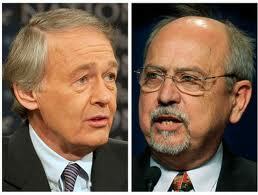 “The Republicans want to not only stand on sidelines, but to take the referee off of the field,” Markey said. So maybe last year’s financial reform law, by strengthening regulatory bodies like the CFTC, really has the best chance of lowering gas prices. Clearly drilling isn’t going to do anything, and neither will the repeal of tax breaks, though that’s what Congress is fighting over now. Of course, many argue gas prices don’t need to come down at all. In order to reverse decades of U.S. public subsidization of car culture and encourage mode shift – and to bring the U.S. in line with other developed nations – gas prices could actually go far higher. Oil prices for this next decade alone will go up significantly and there is not much that can be done about it except nuking other countries that use lots of oil. Though we use more oil than the next 4 countries combined. As demand increases, oil production is already decreasing (peaked in 2006) and over the years, the price of oil will go up to keep demand down to current production levels and prevent oil shortages. This is the beginning of the end for cheap oil and ‘the American’ way of life. Through this period, America will be hit the hardest, because it uses the most oil, its businesses and transportation most dependent on it, and its standard of living is tied to it. Though all developed countries’ economies are dependent on cheap oil too, they are more accustomed to higher prices and less changes will be needed for them to adjust than what will need to be done in the U.S. It amazes me to think of how unbelievably selfish our Westernized society has become. We have burned through most of the world’s easily accessible liquid fuels (and much of its other raw materials) in order to propel exponential growth of consumer culture (and the population that consumes things). As a result, we now we have a tiny, elite class of people that have the vast majority of money and power, and they are hell-bent on maintaining their dominance and spoils, even if it means that everyone else will suffer. These old men who presently run the show don’t even have enough compassion to think about their grandchildren (or possibly their children, at the rate we’re going) and the turmoil they will endure as we transition from a period of unchecked expansion to a new era of violent contraction. Blame goes all the way down to the local level. We have practiced land use policy that places all the risk on the user and very little on the developer and/or business. For decades rural, farmland and urban taxbase has been lost to suburban and exurban development. Many people want the farm without the farmlife, the community without the neighborhood, and government out of their lives. Perhaps people will take away from this that in a democracy, participation is not done solely with your feet.